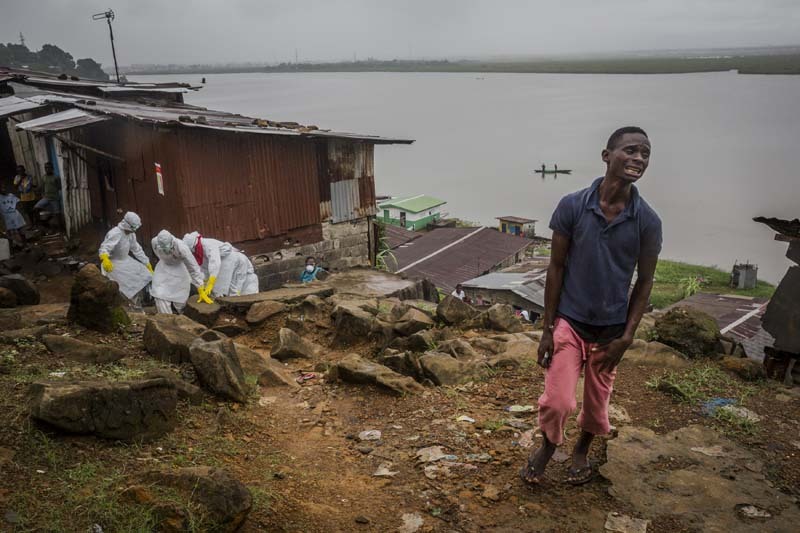 MONROVIA, LIBERIA - SEPTEMBER 18, 2014: Eric Gweah, 25 grieves as he watches members of a Liberian Red Cross burial team, carry the body his father Ofori Gweah, 62, a suspected Ebola victim, on September 18, 2014 in central Monrovia, Liberia. Members of the burial team descended to the compound four times in the past four weeks, down a steep cliff to a riverside area called Rock Spring Valley. Each week, they had picked up a body that passed on the Ebola virus to the next person, this their fifth. The family of the dead man, sick for six days with Ebola’s telltale symptoms, had taken Mr Ofori Gweah, 62, twice by taxi to treatments centres, only to be turned back at the gate for lack of beds. He died in his own bed, his arms thrashing violently and blood spewing out of his mouth, in front of his sons. “The only thing the government can do is come for bodies - they are killing us,” said Eric Gweah, 25. Another son, Marvin Gweah, 28, screamed, “If the government can’t work it out, let them give it up. Let the international community hand this.” Mr Ofori Gweah, the landlord of a compound, was the 5th death of the month from the same compound. The 1st death on August 14th was Dr Wleh, a medic that ran the clinic in the Rock Spring neighbourhood of Monrovia. The second, on the 21st of August, was the Dr's wife, Rachel Wleh. On the 31st of August their son Larry died. Then on September 6, Larry's grandmother died. Mr Ofori Gweah, took the grandmother into his home, after Larry died, as she had nobody else to look after her. According to family members, Mr Gweah handled her mattress. As the spread of the Ebola epidemic accelerated last summer, West Africa's national health systems collapsed, with many hospitals and clinics closing unable to deal with the numbers of people affected by the virus. Thousands of people died before international aid organizations had built Ebola treatment centers with enough to care for the sick.